The World Business Academy and the Clean Coalition have teamed up to provide the Montecito community with a sustainable energy solution during times of crisis. 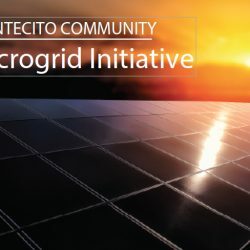 When completed, the Montecito Community Microgrid Initiative (MCMI) will ensure that vital services remain running during emergencies, and serve as a replicable model for other communities looking to transition California to a clean energy future. Kristy Jansen, Chief of Staff for the World Business Academy and Craig Lewis, Executive Director for the Clean Coalition, presented on this exciting and ambitious initiative at the Montecito Community Microgrid Public Meeting held at Montecito Union School on November 14, 2018. Some of the topics discussed at the meeting were: the need to make the area’s local energy systems more resilient to preserve the local economy and standard of living; how the MCMI first insulates critical institutions like the Fire and Water district headquarters, then expands to schools which serve as shelters and gathering areas during crises; and how the MCMI can become a model for other communities to become more resilient in the face of climate change. A community microgrid is a new approach for designing and operating an electric grid based on local renewables and other distributed energy resources, like energy storage and demand response. A renewables-based community microgrid harnesses, stores, and distributes energy from local renewable resources, increasing a community’s energy reliability and resilience while also providing critical support services in the event of a power outage from grid failure or a natural disaster. Although linked to the main electric grid, a community microgrid can isolate from the broader distribution grid during a power outage and provide indefinite renewables-driven backup power to core operations at critical facilities. Providing secure, stable and clean local energy, even during disasters of extended duration, community microgrids are economic, environmentally sound, and resilient. Coastal Santa Barbara which regularly experiences power outages and is connected to compromised transmission lines capable of exposing southern Santa Barbara County to extended, catastrophic energy shortages, is an ideal location to develop a microgrid. Clean Coalition slides are available in PDF or PPT format. World Business Academy slides are available in PDF or PPT format.